Tierney Sneed has written about an interesting report on the costs of Medicaid expansion. 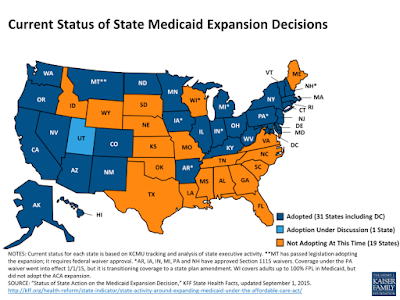 A new Kaiser Family Foundation report released last week suggests that the Republican-controlled non-expansion states are seeing their share of Medicaid costs rise more sharply than expansion states. Here’s the graph that tells the story. 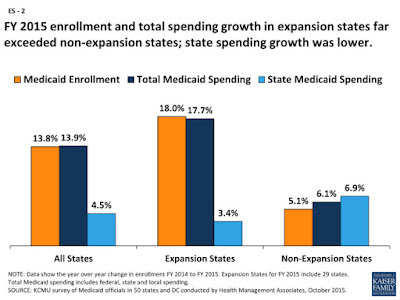 In summary, not only are the non-expansion states covering fewer people, their state’s Medicaid spending is rising at a higher rate than the expansion states. Sneed describes the non-expansion states as “Republican-controlled” for a reason. Just imagine if we were to overlay this map with one showing red and blue states. According to a report by Wade Goodwyn at NPR, if you want to see a state that is willing to throw money away in order to satisfy a political agenda, you need look no further than the red state of Texas. Not only does that state have the highest rate of uninsured people in the country (25%), refusing Medicaid expansion has some of their business leaders hopping mad. He says if the state expanded Medicaid it would save Texas business billions of dollars a year that could be invested in upgrading equipment, hiring new employees, providing raises and rewarding shareholders. For every dollar the state would pay into Medicaid expansion, it would earn back $1.30 from the economic activity created, according to an analysis by Ray Perryman. He’s an economist who has consulted for the Texas Legislature and six governors. That economic activity would top out at $3 billion in 10 years, creating 300,000 new jobs each year, he says. Texas has the third-highest property taxes in the country. In Dallas…more than half of property owners’ county property tax bill goes to reimburse Parkland Hospital for the uncompensated care it has to provide. One wonders when/if the voters of the great state of Texas (and all the other red states that refused Medicaid expansion) will finally wake up to the fact that their representatives are selling them down the river simply to make a political point. There are times I think that at some point pragmatism will have to break through on issues like this and finally start to blur the red/blue divide that is so prominent in our politics today. But then I remind myself of the economic costs the South was willing to pay in order to maintain Jim Crow. Much as people often assume that money is God to conservatives, that’s not always the case. Update: Steve Benen notes that more red states (even Alabama!) are beginning to soften on their refusal to expand Medicaid. Perhaps there’s hope for that pragmatism after all.